AEP follows a systematic approach to qualify sites for data centers. 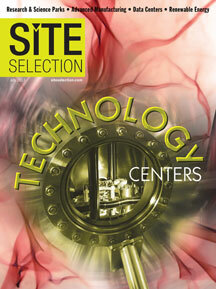 apidly escalating demand for new data centers puts added pressure on site selectors to find qualified locations. The problem? Not all data center sites are created equal. American Electric Power recognizes that fact, which is why the Columbus, Ohio-based utility has launched a site qualification program that seeks to take the guesswork out of the process. The program - believed to be one of the first of its kind in the U.S. - culminated June 4 with the official announcement of nine "Data Center Qualified Sites" for AEP, one of the nation's largest utilities. Following a comprehensive review of locations across AEP's 11-state territory from Michigan to Texas, the Princeton, N.J.-based consulting firm of Biggins Lacy Shapiro qualified sites with reliable and redundant power, strong fiber networks, low disaster risks and a business-friendly climate. Bradley Square in Bradley, W.Va.
Cherokee Expressway Industrial Park in Tulsa, Okla.
Industria Centre in Muncie, Ind. National Cyber Research Park in Bossier City, La. Progress Park in Wytheville, Va.
Roanoke County Center for Research and Technology in Salem, Va. The AEP transmission system supplies about 10 percent of the demand in the Eastern Inter-connection, the system that serves 38 U.S. states and eastern Canada, and 11 percent of the demand in ERCOT, covering much of Texas. BLS teamed with its energy service affiliate, Sugarloaf Associates, to design and implement a three-phase evaluation program that analyzes the electric supply and capacity, access to long- and short-haul fiber providers, water availability, electric costs, tax exemptions and incentives, demographics, vendor-supplier networks, and the ability to complete construction of a data center facility within 18 months. A third-party engineering firm - Intelligent Building Systems - was then hired to model each site's ability to accommodate a 100,000-sq.-ft. raised-floor data center designed to current industry specifications. "The data center pre-qualification process allows us to clearly understand the needs of the data center users and distinguish AEP as an electric utility able to support those needs. It gives our service territory an advantage in the highly competitive site selection process for data centers," says Mark James, CEcD, vice president of economic and business development for AEP. "BLS helps us objectively evaluate sites and provides a deliberate, disciplined approach to collecting and presenting the information needed by data center users." AEP, whose service territory spans 250,000 square miles of the U.S., has a long history of providing competitive sites for data centers, including recent location projects from Discover, TJ Maxx and Citicorp. An HP data center in Tulsa is one of the "greenest" in the industry, relying primarily on non-fossil fuels for power and using water to cool the server space. It also uses biometric access for security and has walls that can withstand winds up to 300 mph. With the advent of the qualified sites initiative, James believes that AEP is poised to become a dominant player in this highly competitive field for a long time to come. The Roanoke County Center for Research and Technology in Salem, Va., is one of nine qualified sites for data centers in AEP's 11-state service territory. "Third-party validation makes a big difference," says James. "This is really the equivalent of a Good Housekeeping Seal of Approval for data center sites. This program means that all of our qualified sites have been thoroughly vetted and that the data we have on them is highly credible and third-party sourced. This counts for a lot when you are talking to a prospective end-user." Tracey Bosman, managing director for BLS, heads up the site qualification process for the consulting firm and notes that it is the most comprehensive and demanding in the industry. "Before we even looked at the individual sites or evaluated the costs of power, we reviewed the utility policies and tariffs that were in place," Bosman says. "It is not just a site review. AEP has done a very rigorous review of all of these policies and procedures that can affect data centers. AEP is not the first to do a qualified sites program, but they have taken it to a whole new level in focusing on the data center sector." Tim Comerford, principal of Sugarloaf Associates and senior vice president of BLS, notes that "the electric infrastructure and fiber availability are the two most common traits of these nine qualified sites. Their service policies and cost to supply service are also very good. We found them to be competitive across the board on power rates, and they are extremely competitive on rates when you compare them to Chicago and places in the Northeast." James explains that the new program originated out of an idea two years ago. "I came back to the utility in November of 2011 and I discovered then that a lot of our communities in the AEP service territory had not gone through an exercise of identifying their suitability for any kind of use," he says. "In our economic development efforts, that is one of the things I knew we needed to budget for - development-ready sites and buildings." James says he attended a couple of data center conferences and "learned that the central part of the country was becoming the preferred location for data centers for a variety of reasons. The industry had become very active, and we had the characteristics that made us conducive to data centers." Electric utilities like data centers because they have very high load factors - typically in the 90-percentile group in load factor. Also, housing a data center in a community provides a capacity for hospitals, research and development centers, and other intensive users. In short, "data centers are very desirable operations for AEP and our community partners," says James. Muncie, Ind., is a case in point. "Five years ago, I don't think they would have gotten any looks from data center operators," James adds. "Now, thanks to our qualified sites program, they have gotten lots of looks." Data centers also offer a future growth opportunity for AEP and its service territory, says James. "The fact that this is a rapidly growing industry sector is a significant factor," he explains. "The best utilities skate to where the puck is going to be with their business. It is only prudent that we identify and direct the activity to locate where we will serve them well." Comerford notes that "demand for data centers continues to grow. Demand for new data center space is growing at 20 percent a year on the coasts and double that in the central part of the country. Everyone wants streaming video now, and that places an added demand on data delivery. And with the new requirements of the federal health-care legislation, medical records have to be stored digitally and available online now." Bosman says the exponential proliferation of data will not abate anytime soon. "Ninety percent of the data we use every day was created in the last four years," she says. "And we are constantly adding to that storehouse of new data every single day." Escalating demand is also putting a strain on investment capital. "An investment of $2,000 per square foot is the typical cost to build a data center," says Comerford. "And it can cost $50 million a year to refresh a 130,000-square-foot data center. That is pretty typical." Because of these high investment costs, says Comerford, "you don't make that investment until you absolutely have to. So when a data center end-user makes the decision to build, they need to move extremely quickly." This investment profile was prepared under the auspices of American Electric Power. For more information, contact Mark James at 614-716-2396 or by email at mjjames@aep.com. On the Web, go to www.AEPdatacenters.com.